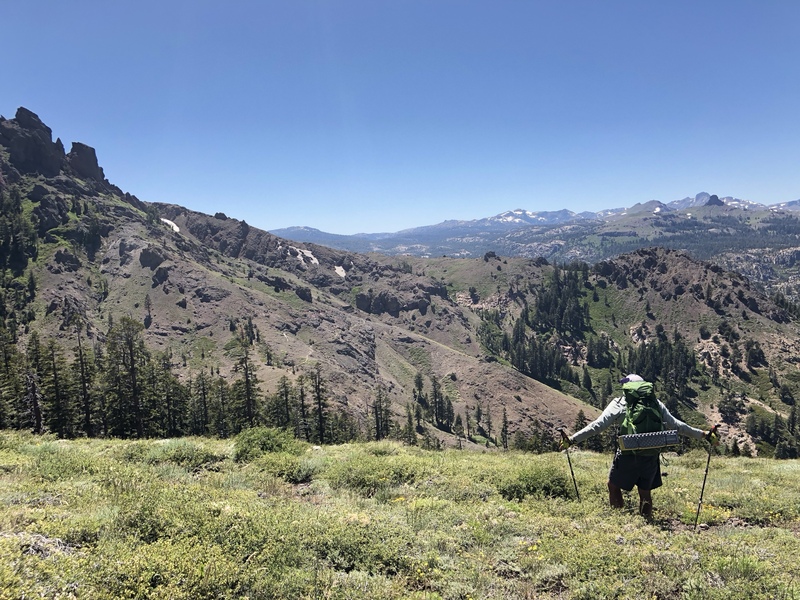 The air was warmer and the trail was dryer as we continued to head north from Sonora Pass. That’s not to say that we didn’t continue to encounter snow, but we were no longer required to wake up at 3 AM to hike over snowy passes! 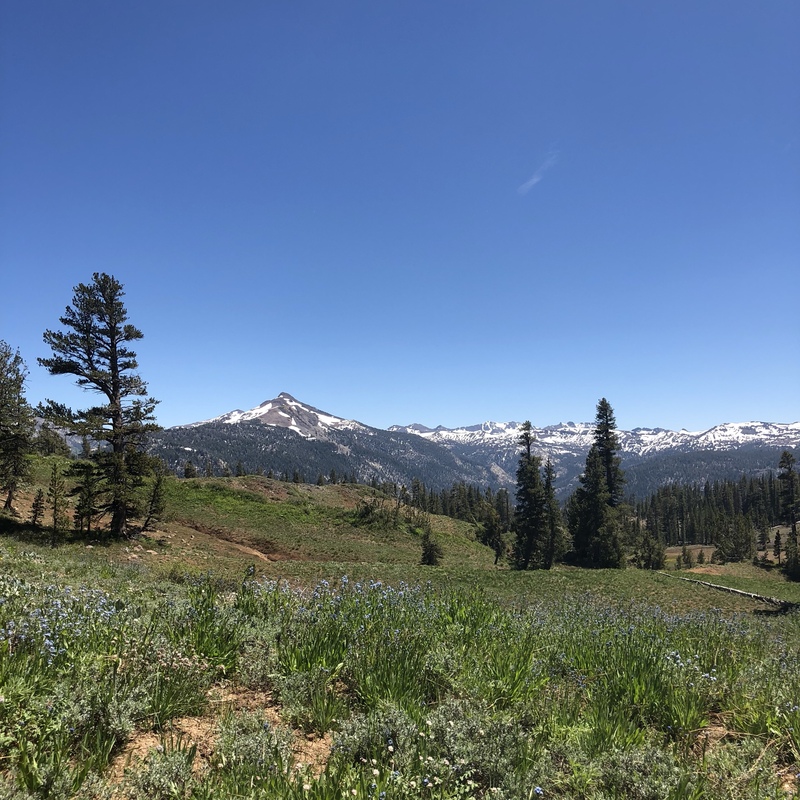 Our days of hiking into South Lake Tahoe were filled with vastly different mountains. 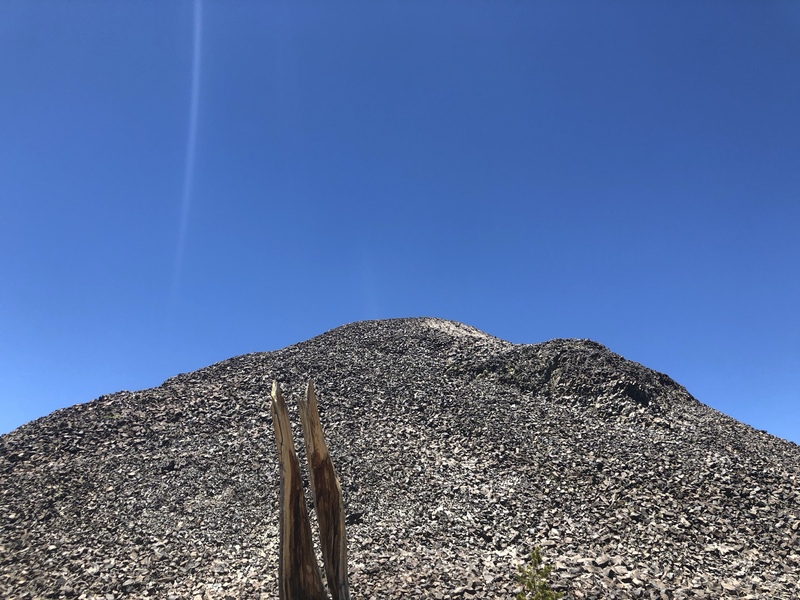 We were now hiking among volcanic-formed mountains rather than the more glacially influenced forms of the High Sierra. Instead of wet shoes, they were caked with red dirt that seeped through to our socks and then to our feet. 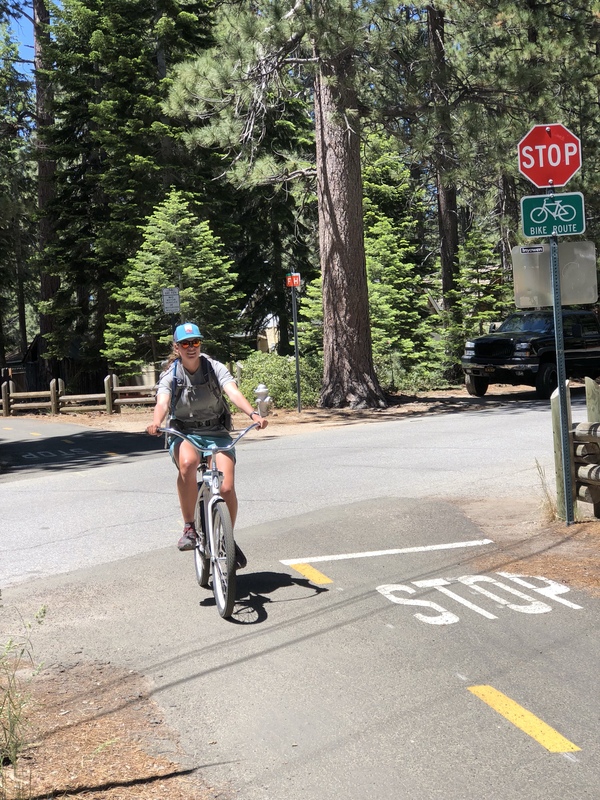 It’s not often you experience two bouts of trail magic in one day, but were that lucky on our day before getting into Tahoe. 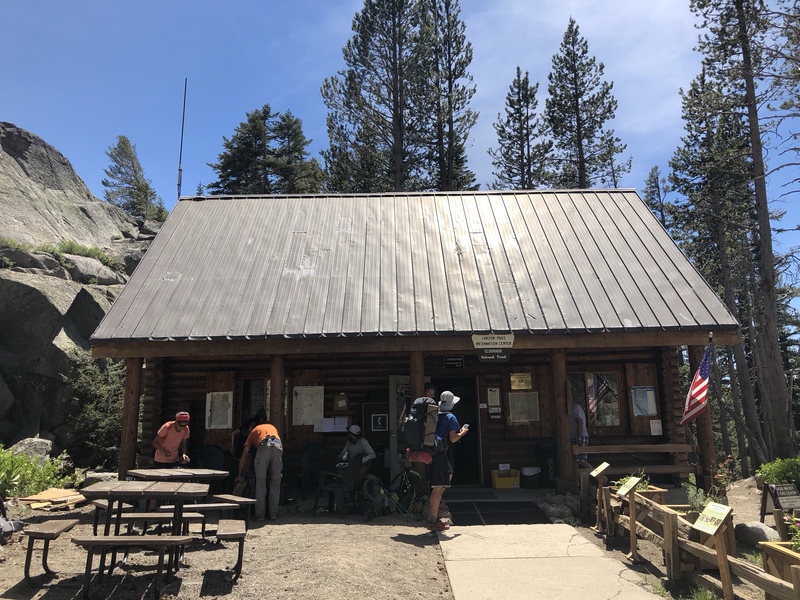 We arrived at the Carson Pass Information Center in the afternoon and the three volunteers there eagerly brought us plates of pretzels, Nature Valley bars, and cherries along with a cold soda as we at out front in the shade. They also willingly filled our water bottles for us and were super helpful. We had only planned to stop in and use the pit toilets and empty our trash, so this was a nice surprise to add in to our afternoon. 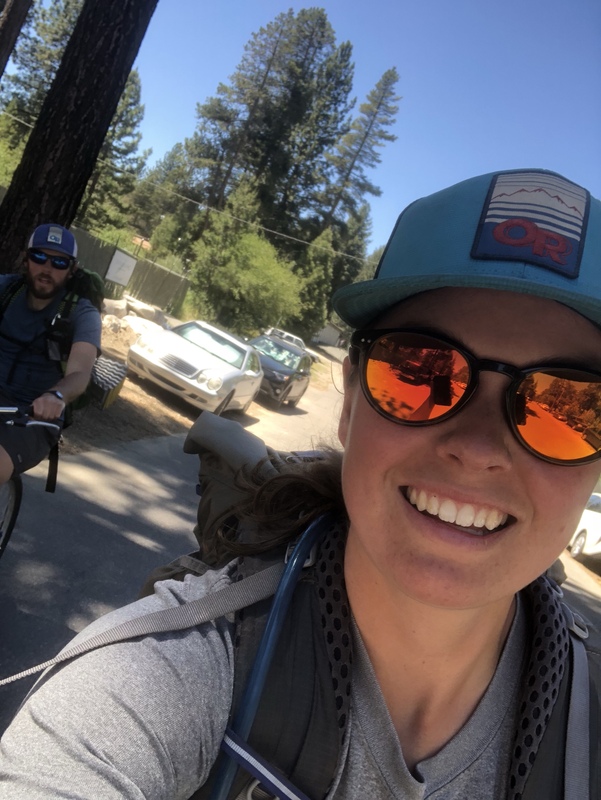 We replied, “Yes!” And then we devoured three hot dogs each and cookies as Kelly, from the Bay Area, did her first round of trail magic. We were honored to be some of her first recipients. It was such an awesome way to end the day and saved us from cooking dinner in the mosquito-infested camp area. It’s so much easier to wake up early when you know you’re going into town for a zero day! We were fortunate enough to get a ride into town from the first car that passed. Dixie, a longtime local, was kind enough to give us a tour of the town before dropping us off at the laundromat. The town was packed as we came in on a weekend, so the only place where we didn’t have to wait for breakfast was McDonald’s. Even that was crazy busy! After laundry and breakfast, we planned to walk to the post office so we could pick up some packages. We randomly got a ride from an Appalachian Trail thru-hiker who hiked the trail in 2013, the same year as us! While we didn’t meet on trail, it was really cool to meet another 2013’er. 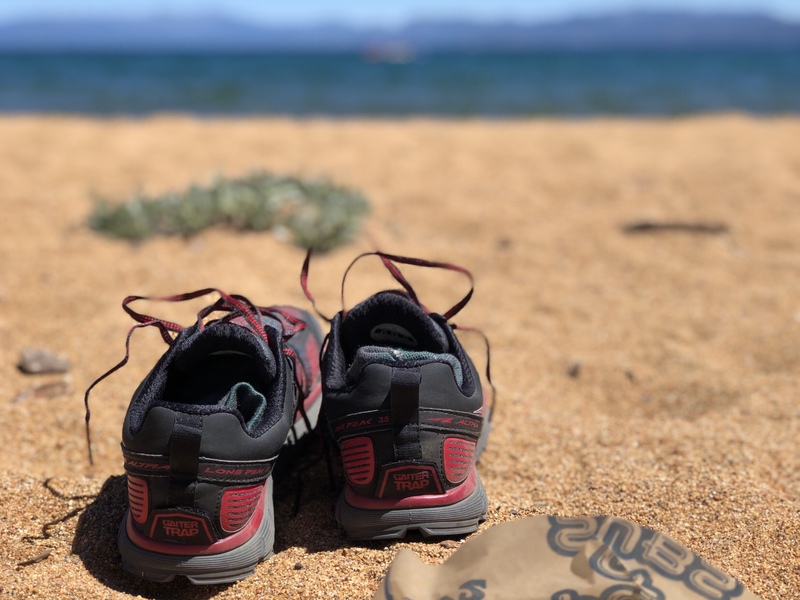 He was hiking the Tahoe Rim Trail, but had to go back home to Hawaii for work, ending his hike short. We waited outside the post office with several other hikers for the noon opening as it was a Saturday. The line was at least 20 people deep by the time the doors opened! 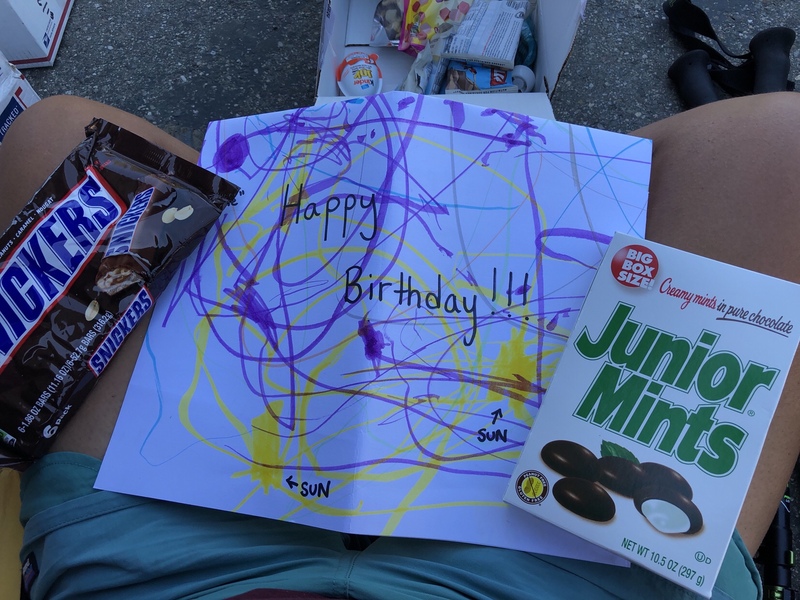 We had 5 packages to pick up, with two of them containing birthday goodies from my best friend, Sarah (and a handmade card from her 2 year-old son) and from my parents as well! I also picked up some much needed new shoes and our bounce box. Next order of business was to find a bar to watch the Germany v. Sweden World Cup match. Miles is a Germany fan. I was rooting for Iceland as the underdogs in the tourney. After resupplying at the grocery store, we planned to take the local bus down to the Stateline area where our hotel was located. Well, the bus never came at its designated time, so we opted for a Lyft instead. I am SO glad that we splurged for the Lyft! We were chatting with our driver when he brought up that Robert Plant was doing a show in town at Harvey’s Outdoor Arena. As a drummer and a band nerd in high school, Led Zeppelin was one of the first bands that I really got into as a teenager. When my dad introduced me to Physical Graffiti, I was hooked. I texted my dad to let him know and he told us he would buy us tickets as a belated birthday present. 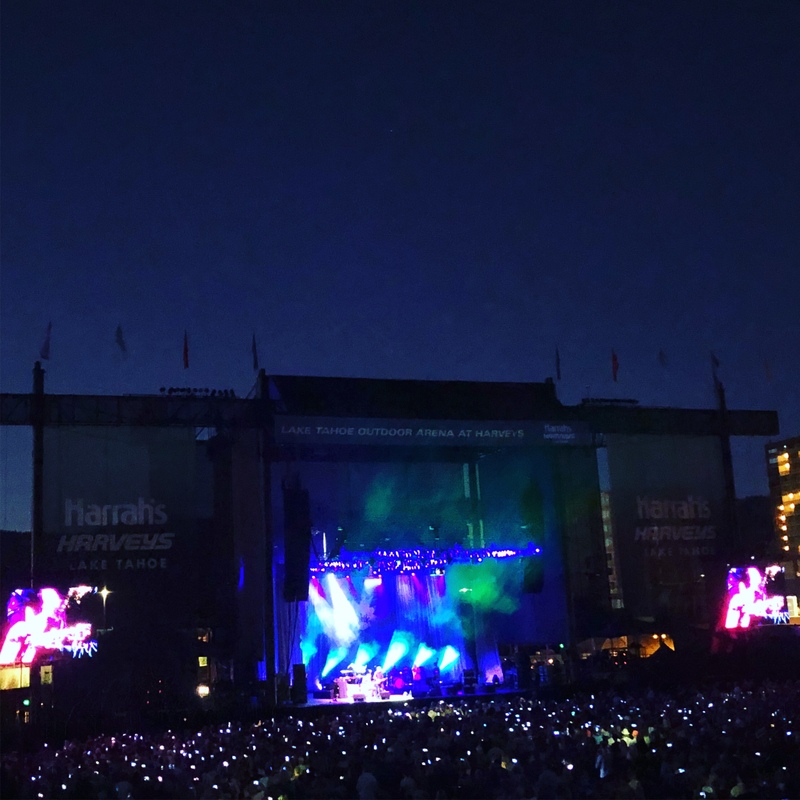 We were tired and were dreaming of laying in our hotel bed all night, but instead took him up on his offer and went to the show! It was so worth it and I have to say, Plant still has quite the voice all these years later. 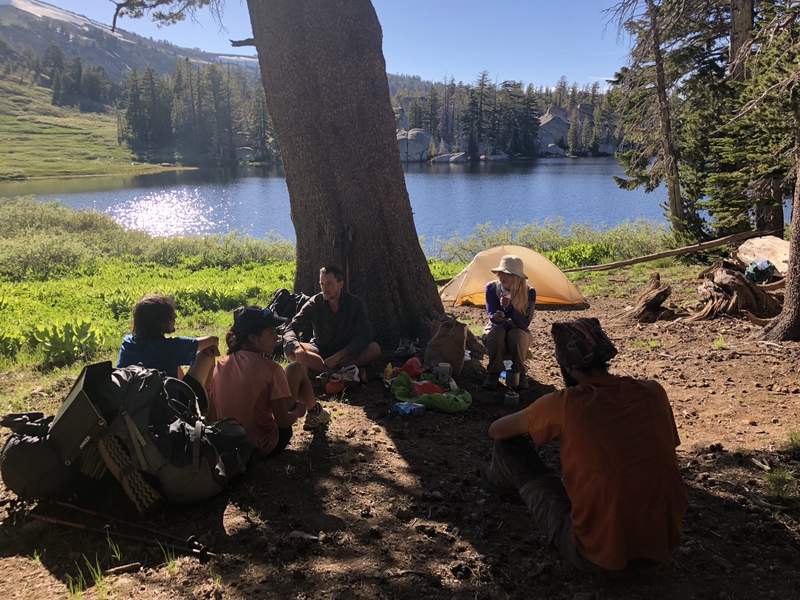 We felt sort of like normal people for a night instead of thru-hikers. Although, not many other concertgoers donned matching Altras and down coats to the show. We didn’t drink too many beers, so that we could be up early for our trek to Baldwin Beach on the lake. We rented bikes and went out to the beach about 10 miles from our hotel. I know that we’re supposed to rest on a zero day, but we couldn’t pass up cruising on bikes to the beach. By biking there, we beat out the line of cars and the parking fee. We spent a couple of hours laying out on our sleeping pads, soaking in the sun and eating sandwiches. After heating up, we both jumped into the lake, which was the perfect temperature. 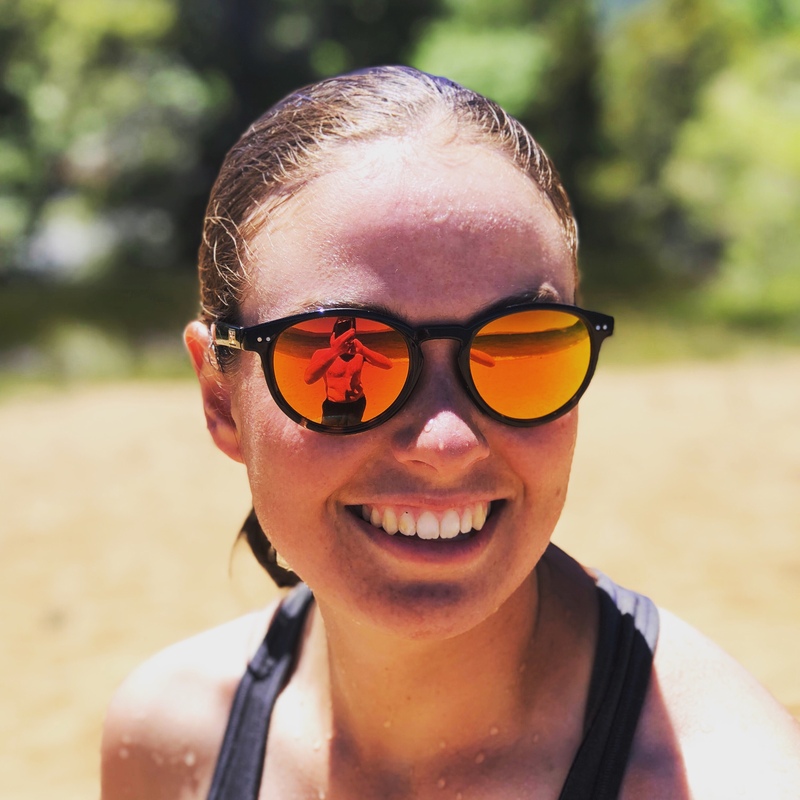 We only had our bike rentals for so long, so it was tough to haul ourselves out of the water to bike 10 miles back to town. 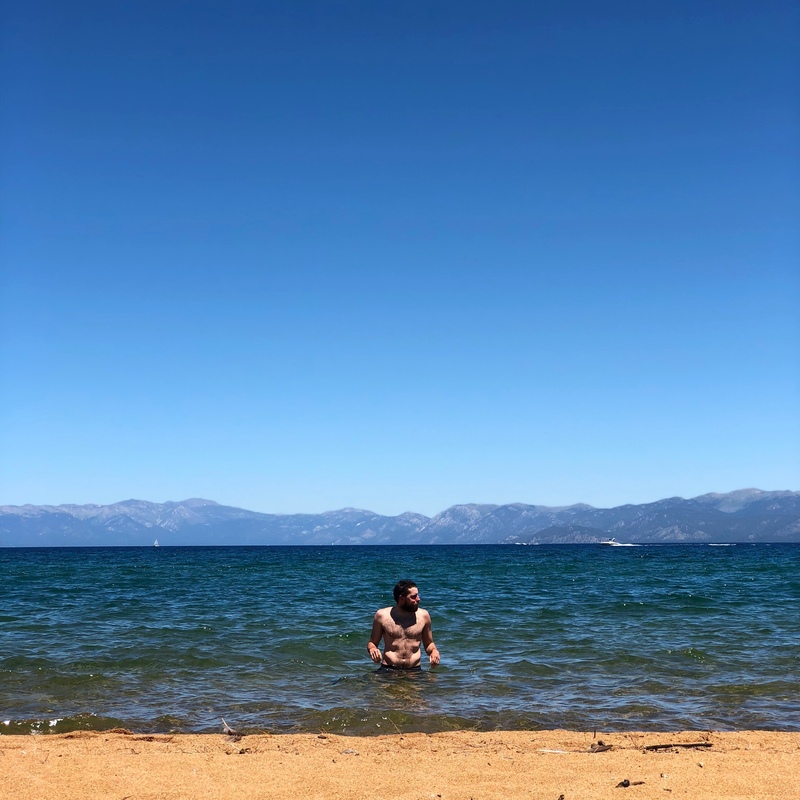 We definitely want to come back to Tahoe to enjoy some more beach time. 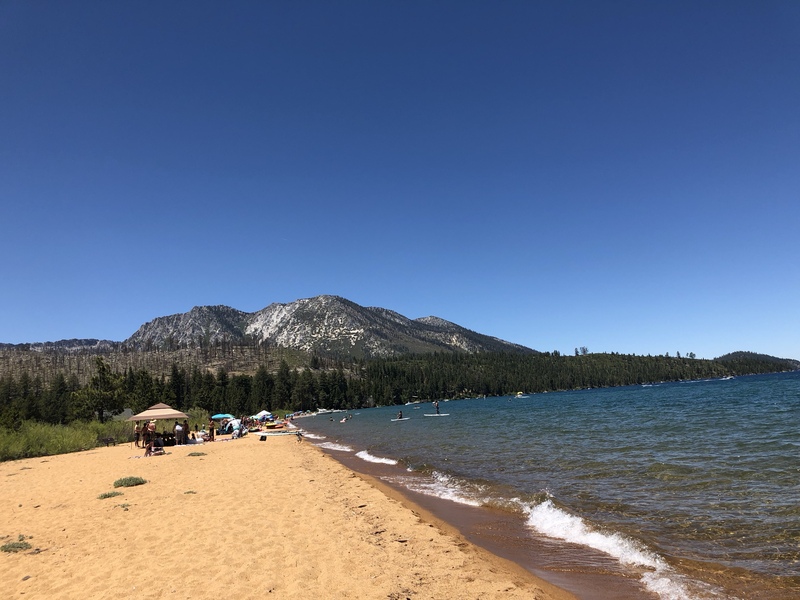 While we live steps from the Atlantic Ocean, there was something special about relaxing along the calm lake water of Tahoe with the mountains surrounding us. A little hot from our bike ride, we enjoyed some ice cream and then called family back home. It was really special being able to talk to my nephew who had just lost his first tooth! He sang ‘Happy Birthday’ to me and showed me some of his latest artwork. I sure do miss that little guy. 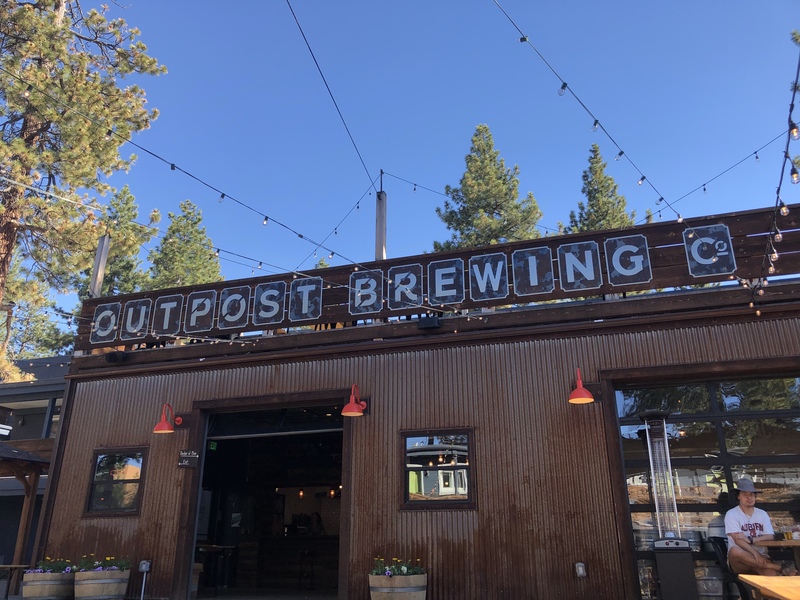 Our last stop on our zero day was to walk over to Outpost Brewing Co. on the California/Nevada border. 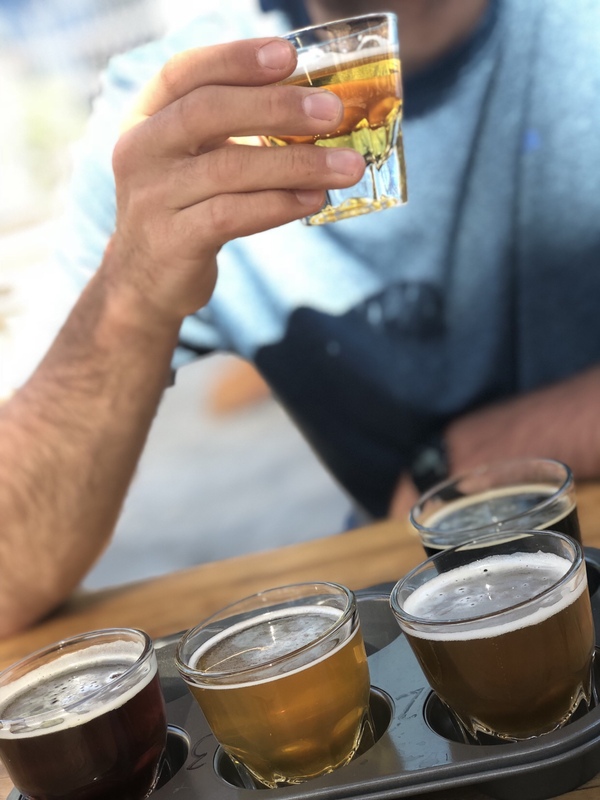 We each got a flight and enjoyed a couple of pints listening to some live music outside and even got a shout-out as PCT hikers! We ended the night getting some Mexican takeout and watching World Cup reruns in our hotel. 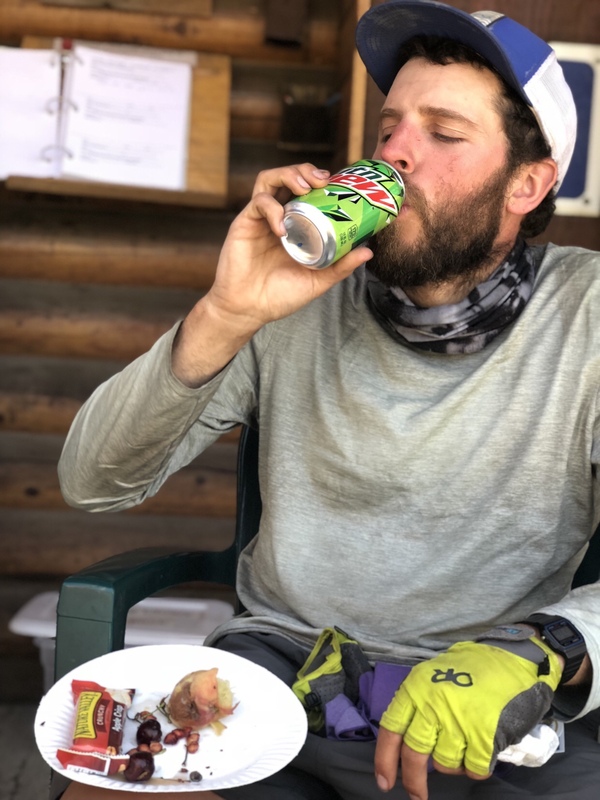 If you read one of my first posts about the possibility of Miles and I splitting up on trail, then you may have been wondering if and when that would happen. 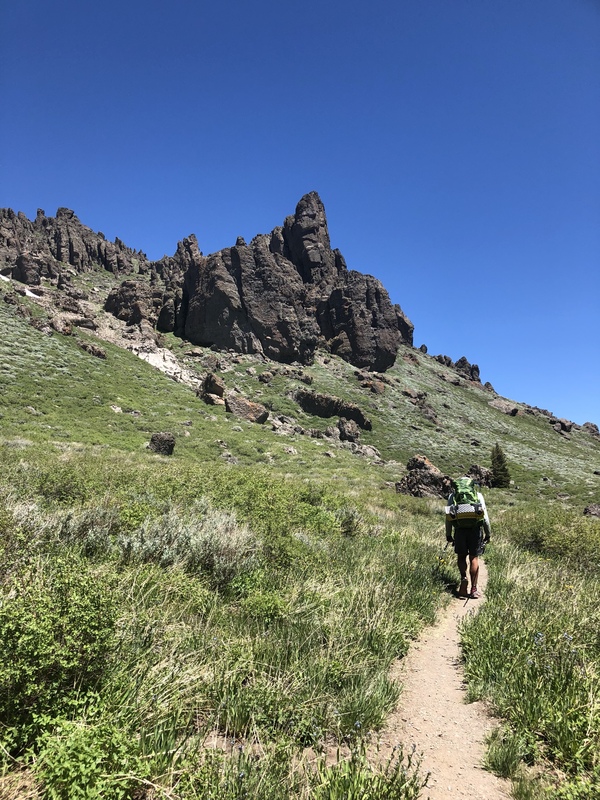 Back in Bishop, we made the decision that after Tahoe, Miles and I would hike solo so that he could do the big miles to finish on time before the school year. He’s a teacher and has been applying for jobs while on trail. This would mean however, that we would have to average 28 miles per day to reach the Canadian border by mid-August. There was no way in hell that I would be doing that. 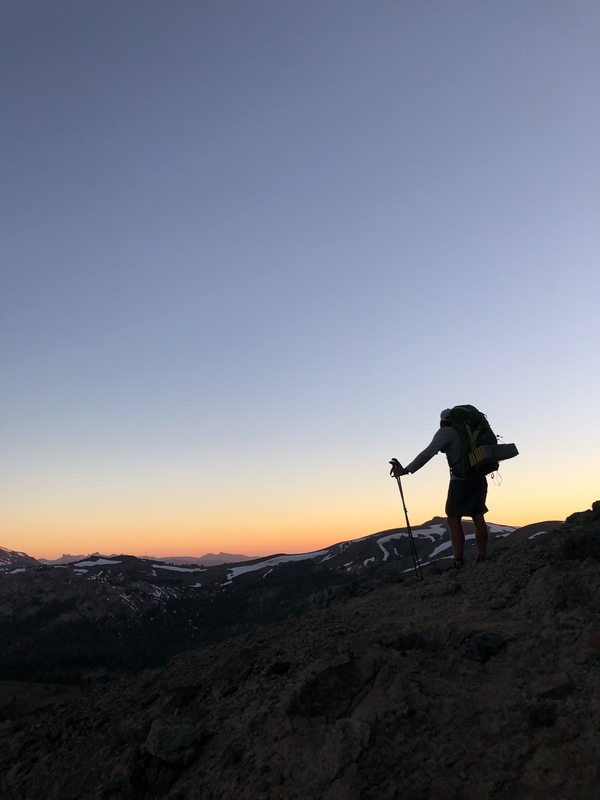 So, we decided the best thing to do would be to hike solo for the remaining 1500 miles of the trail. 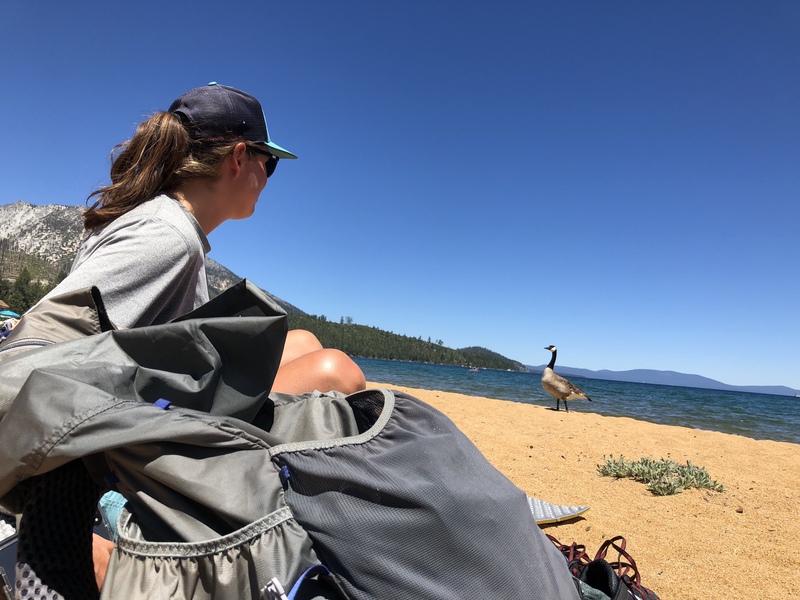 We left Tahoe with the intention of splitting up that day as we hiked out, but it did not happen…yet. Splitting up is harder than you think. Especially when you’ve hiked with someone for over 3,000 miles.